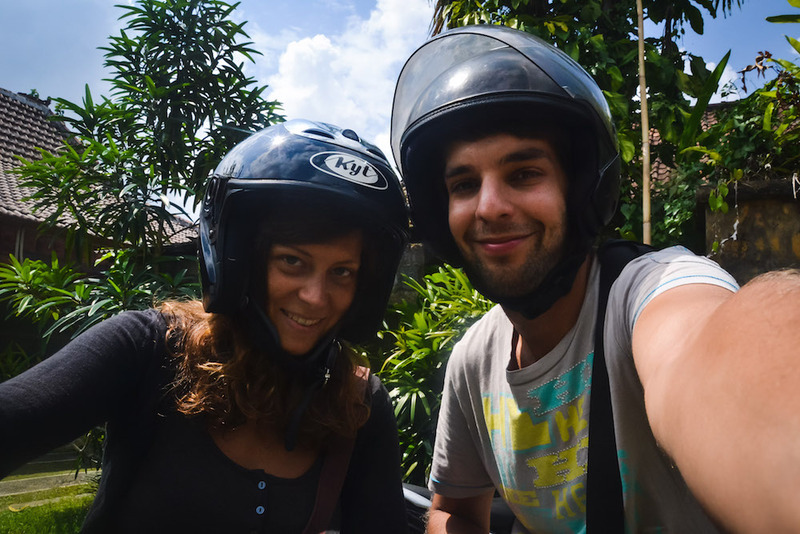 Are you planning a day trip from Ubud with a scooter? In this particular travel blog article, we will tell you which places we explored and what you should know when it comes to riding Scooters here. Yes, Bali is touristic. 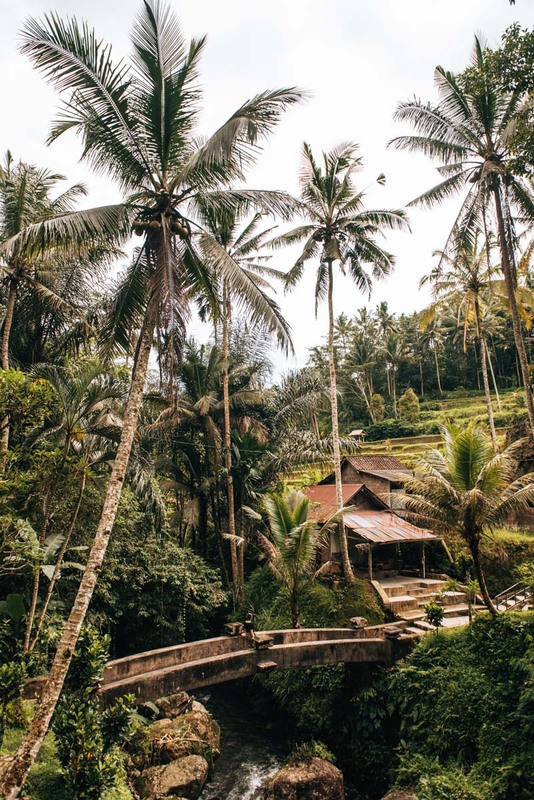 Very, very touristic in fact – and Ubud is no exception. Nevertheless, Bali is fantastic! 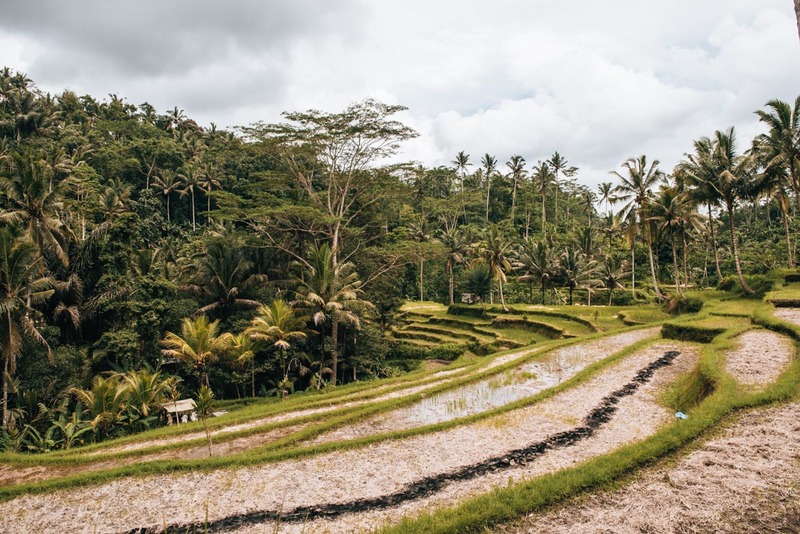 What we find really impressive – or rather what blows us away about Bali every time we visit, is the impressive landscape with its lush green backdrop, rice fields, and volcanic landscapes. Bali is most unique for its nature and not (as many people assume) in its beaches. Almost every time we visit Bali, we make Ubud our home base and explore the central island from there. Our tip: Rent a scooter. Honestly, you will thank yourself for it later. Forget taxis and private drivers – unless you want to be comfortable and not have to think about directions. They are expensive and deprive you of your freedom to stop whenever and wherever you want. Rent a scooter and enjoy your freedom, enjoy the wind, enjoy the carefreeness. In this blog article we will share with you our route for the region surrounding Ubud. The landscape here is so breathtakingly beautiful that we lack the words to do this place justice. 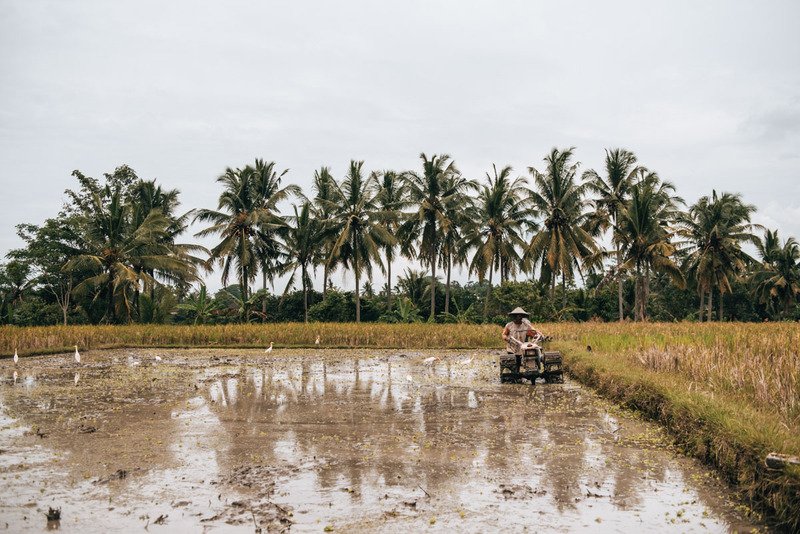 Even just the feeling of whizzing around on the scooter through landscapes lined with rice fields – writing this blog entry brings back many fond memories. Overall, you should plan a whole day for our route. If you prefer to have more time and comfort, we recommend dividing the day trip into two days. Best to go early in the morning – preferably before sunrise. 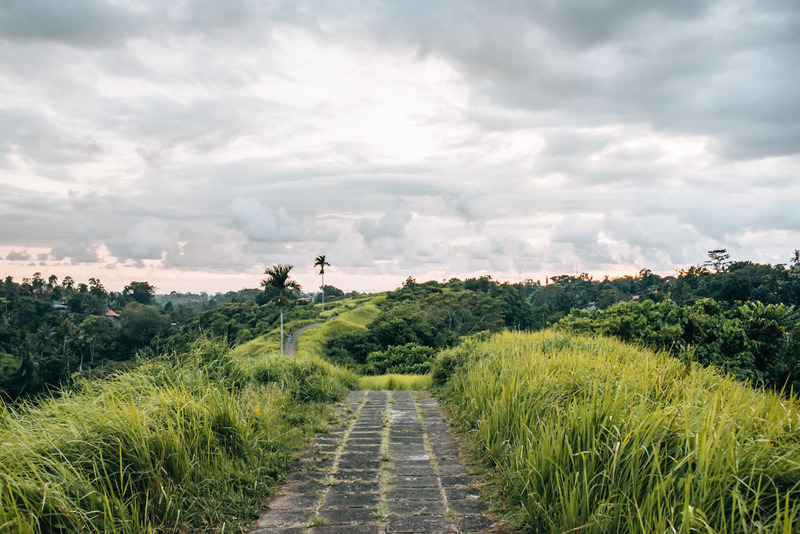 The Campuhan Ridge Walk is not a secret in Ubud. Nevertheless, we believe that a visit is definitely worthwhile. The short hiking trail leads you through the beautiful landscape of Ubud. You are rewarded with beautiful views of the lush green nature in all directions. It is about two kilometres to the well-known Karsa Café. If you have limited time, you can just do the first section of the track. You will reach a well-known photo spot in about 15-20 minutes. 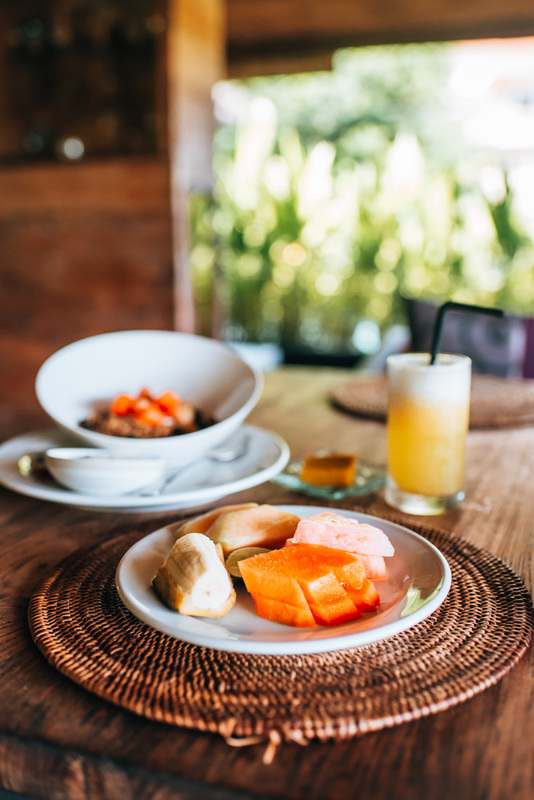 There is a lot going on here during the day – but at sunrise you can enjoy the magical atmosphere of Ubud in peace. Getting there & Parking: We have marked the starting point of the Campuhan Ridge Walk on the map for you at the end of the article. You can basically park your scooter at the entrance. The Tegalalang Rice Terraces is one of the most famous sights around Ubud. The sooner you get there, the better. Apart from the fact that the light is wonderful for sunrise (if you’re lucky with the weather), you can visit the rice terraces in the morning with more peace and quiet. Depending on the stage of growth, the rice terraces always look a bit different: everything from mini plants in standing water to lush green nature is possible. Our tip: Take a little more time here and walk down the terraces. There is no entry fee. Also, just so you are not hit with a surprise, there are countless souvenir stalls, restaurants and cafés here. We made the best of it and indulged in a delicious cinnamon tea at a café and enjoyed the view. Getting there & Parking: From Campuhan Ridge Walk, several trails lead north to the Tegalalang rice terraces. We like to stick with the side streets (eg. Jalan Suweta) and avoid the main roads. Parking is possible on the roadside at the rice terraces with no problem. We never had to pay a parking fee, but we have also heard the opposite. Continue in the direction North. Gradually, the traffic becomes much lighter and the temperatures also drop. 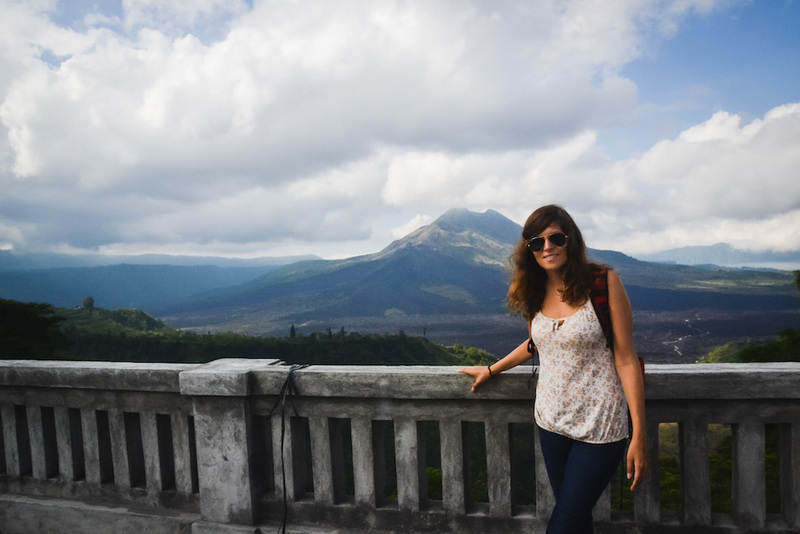 Our destination is the mountain region Kintamani, where the volcano Batur is located. Admittedly, at the beginning we did not plan to ride to Gunung Batur. But once we got there, we wanted to see the impressive active volcano with our own eyes. Along the Jalan Raya Penelokan, you will find some lookout points. No wonder some restaurants have settled along the road. If you want to enjoy lunch with a view, then you are in the right place. However, the prices are usually a bit higher due to its location. You can also ride down the road to the crater lake, which we didn’t do. We should point out, however, that the stretch from Tegalalang to Gunung Batur takes a comparatively long time and it starts to get rather uncomfortable sitting on the scooter for that long. Nevertheless, we don’t regret it for a second. The volcanic landscape view is just stunning. Also very worthwhile is the ascent of the Gunung Batur at sunrise. If that’s what you’re planning to do, we suggest that you book a pickup tour from your accommodation. The tour starts at 2am in the middle of the night. Getting there with the scooter: The journey from the Tegalalang Rice Rerraces takes approximately one hour. 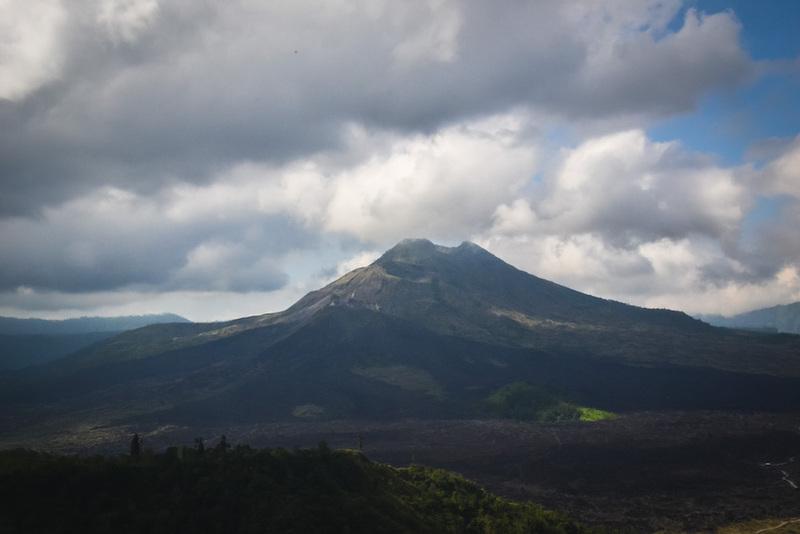 Kintamani charges a fee of 30,000 IDR per person. You can usually park on the roadside. The Tirta Empul water temple is one of the holiest temples in Bali. With its magical, spiritual atmosphere, it is still one of those places in Bali that radiates something special. 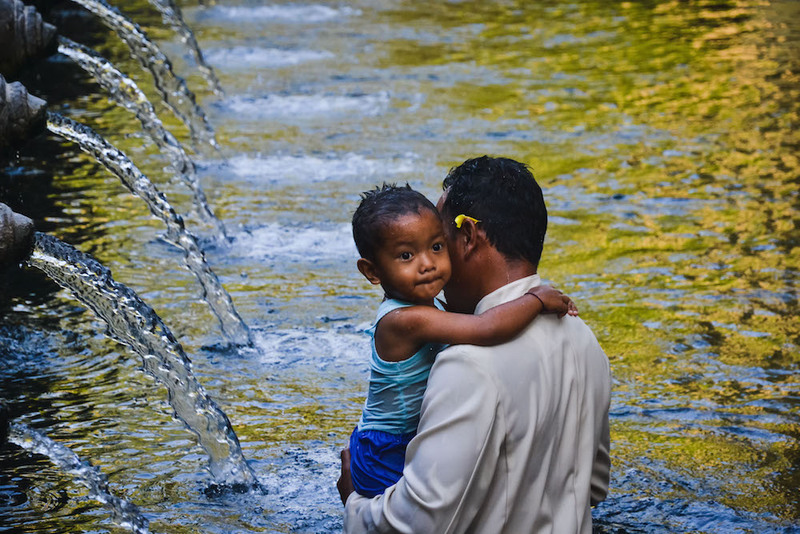 As other people also seem to share this opinion, the Pura Tirta Empul is becoming increasingly popular. This can be seen by the numerous souvenir shops, which have popped up. 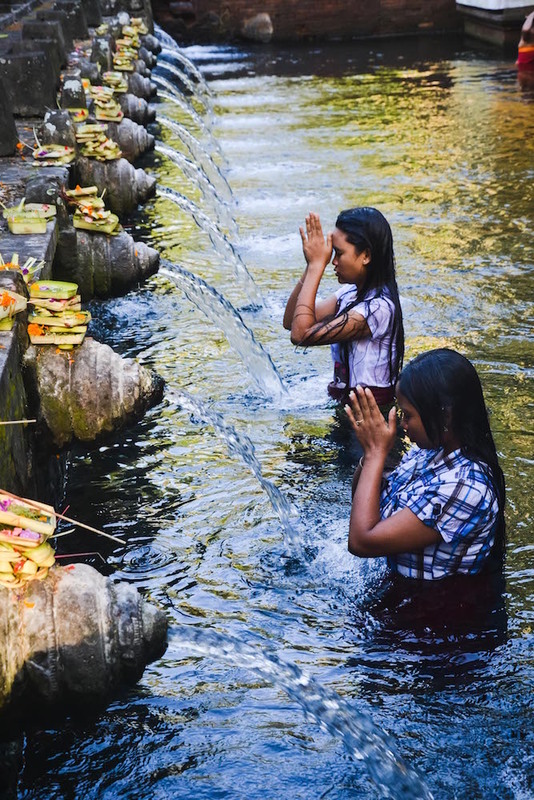 We are not surprised that the Pura Tirta Empul is a magnet for visitors. You can observe in very close proximity, the Balinese Ritual Purification Procession with the holy spring water. If you find this interesting, then you will love the temple. Personally, we find it incredibly fascinating to observe the people doing this. It is also possible to borrow a sarong and even enter the pools – however, out of respect, it’s our opinion that this ritual should be reserved for the devout Hindus. How to get to Pura Tirta Empul: From the Gunung Batur, the Tirta Empul is practically on the way home. We have pinned the exact location on the map at the end of the article. There is a big parking lot where you can park your scooter (fee 2,000 IDR). Admission to Tirta Empul is 50,000 IDR (as of January 2019). Note: The temple closes at 6pm. 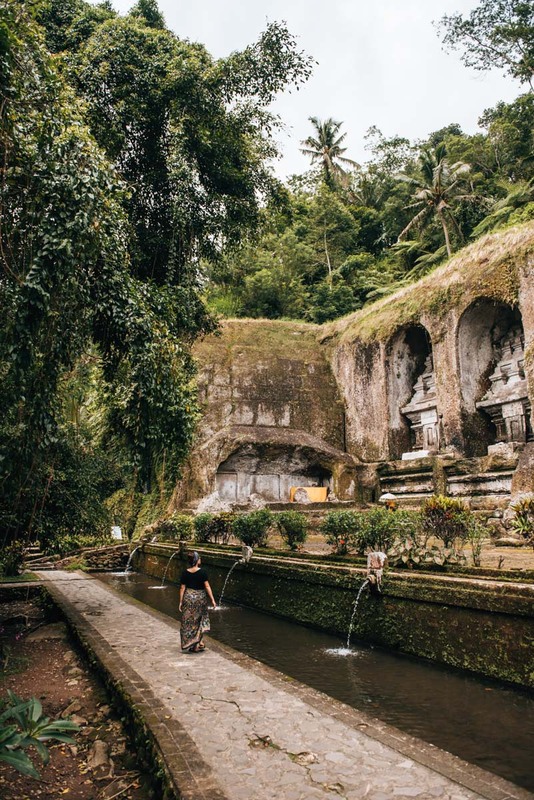 Just a stone’s throw away from the Pura Tirta Empul is a temple – by no means less impressive – called Gunung Kawi. First of all, it’s important to note that: There are two temples in this region, both of which bear the name Gunung Kawi and are not that far from each other. We have visited both before, but in this blog article, we are referring to the larger of the two. Depending on how long you have been on the road already, it may be too late to visit Gunung Kawi, as it closes at 5pm. For the tour of Gunung Kawi you should plan at least one hour (which is rather tight already). The reason for this being, that the actual temple is located in a valley and can only be reached at the end of a long flight of stairs – a total of 300 steps in fact – and you have to make your way up again at the end. Our tip: take enough water with you. For emergencies, there are also some shops along the stairs. Just because of the spectacular location in the valley, the rock temple Gunung Kawi is incredibly impressive. The scenery with the surrounding rice fields is simply stunning. As a bonus, there are generally fewer visitors on the way than one would expect. Getting to Gunung Kawi: Only about five minutes by scooter from Tirta Empul. Admission is 50,000 IDR (as of January 2019) and there is adequate parking offered (parking fee 2,000 IDR). Ok, now it’s really time to head home to Ubud so that you don’t get back in the dark. 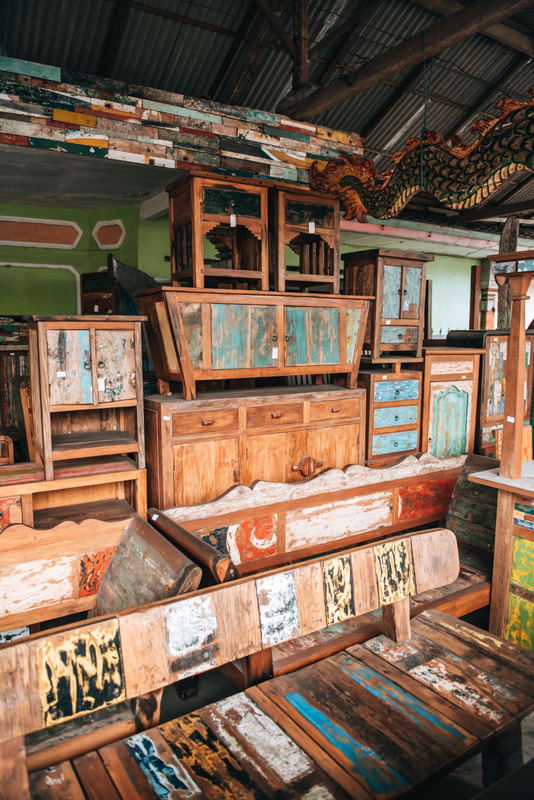 On the way back, you will drive along the main road past countless craft shops, where they sell furniture, wood carvings, sculptures and much more. In between, there are also workshops where you can see the pieces being made. Those who knows us, will know that furniture is our weakness! We love unique custom made furniture and would secretly love to just import several containers full of chests of drawers, boxes and other trinkets. It is not surprising that we were particularly excited about this section of the journey. Whenever we drive past here, we make sure to stop and admire the furniture, whilst inquiring about the production and shipping. And, believe it or not, we’ve actually shipped a few pieces from Bali in the past. Nowadays, we have Balinese pieces of furniture decorating our home in Vienna – but that’s another story. We always rent our scooter from our accommodation. The price for one day is usually between 50,000 and 60,000 IDR. One thing you should be adamant about, is that a good and well-fitting helmet is included. The majority of what gets handed out here is a joke when it comes to safety. Important to know: Officially, you are only allowed to drive scooters in Indonesia with a motorcycle license (class A). When you rent a scooter, they often don’t ask you to show your license but just want to know that you have one. Many people make the mistake of thinking that scooter riding laws are universal and that a simple driver’s license will do. So it might happen that you get stopped at a police check and end up being fined for not having a Motorcycle (Class A) Driver’s License. It may be worth getting an international driver’s license (not a requirement for renting), but in case they catch you without a Motorcycle License, they might take this into consideration – however, they usually try their best to fine tourists. 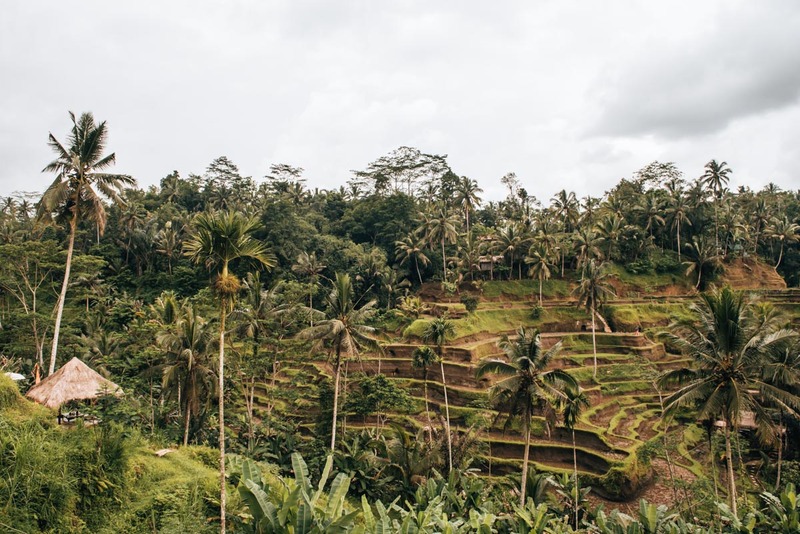 We have often read that the police around Ubud carry out regular checks and inspections – their main targets being tourists and tourists almost always end up getting fined due to these police checks. Despite having been on the scooter for multiple days and even made it all the way to Denpasar, we were never stopped or controlled once. This could be because we actively tried to avoid the main roads – primarily for safety reasons – but we also prefer to drive on the secluded, less travelled roads. In Indonesia, you have to get used to left-hand traffic, so it’s best to practice on low-traffic roads before venturing out on longer routes. There is not much traffic once you get out of the city centre, but the traffic situation in the centre itself is very different! Best to get out of the city as soon as you can. The road conditions are usually not bad, but definitely prepare yourself for the odd pothole and rough gravel or sandy roads. In case of doubt, it’s safer to drive too slow than too fast – this is especially true when it starts raining, as the road becomes slippery when rainwater mixes with dust. The corners are where it’s most fatal. We usually ride with long sleeved clothing. Apart from the fact that the wind gets rather cool and breezy if you’re out riding too long, it also acts as an extra layer of protection in case of small accidents. Always best to have a raincoat/rain jacket with you as the weather is can be very unpredictable here. Most importantly, never assume that any damage is covered by insurance. Most scooter rentals in Bali do not include insurance. When something happens, you pay. Of course, this becomes problematic if you get into any major accidents. It is also important to realise that your travel or health insurance will not cover you in case of any claims made if you don’t have a proper legal license to drive a scooter here (ie. no motorcycle license). There is always risk associated with riding a scooter in Bali – it’s a consequence you have to be aware of! 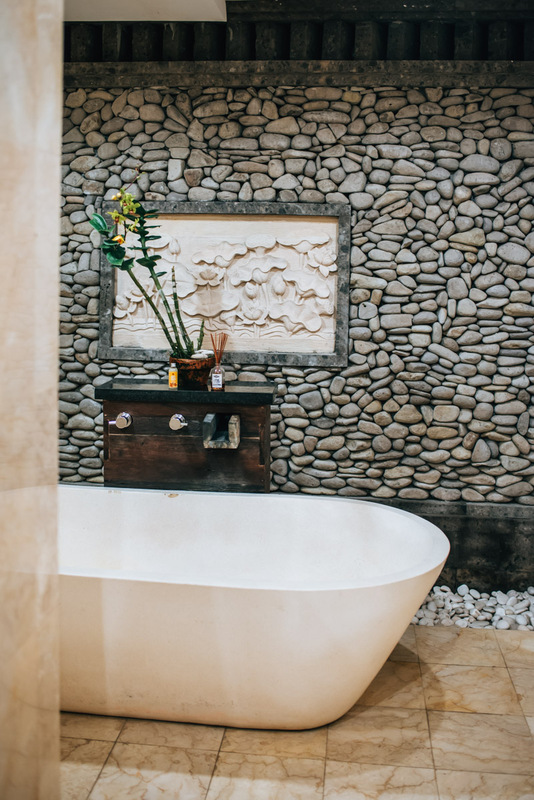 Sri Ratih Cottages: Our favourite! Beautiful, well-kept, with a rather extensive area situated just outside the town centre with a beautiful pool. By foot you are just a 10 minute walk away from the centre. Very nice rooms and delicious breakfast. The spa is fantastic: Here we were able to enjoy the best massages in all of Indonesia. Ila Villa Ubud: A nice hotel, but quite far out (about 5-10 minutes by scooter in the centre of Ubud). The rooms are very pretty, but our first room smelled super mouldy so thankfully we got moved to another room upstairs, which was really great. The breakfast is delicious and the staff very accommodating. There is also a small pool. This blog article contains our personal recommendations in the form of so-called affiliate links. If you book or buy something through these links, we will get a small commission. For you, this does not change the price at all! A million thanks from the both of us! Have you ever been to Ubud and done a scooter trip around the area? 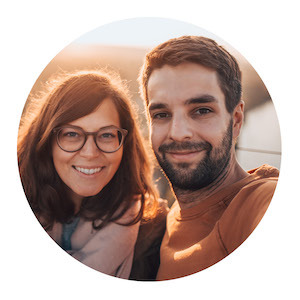 Tell us about your tips and experiences – we look forward to your comments. This is still relevant at the end of 2017! The volcano really is incredible, there is a good museum there too now about volcanic activity. Avoid the restaurants on the volcano’s rim though – expensive and very poor. Eat elsewhere! We got pulled over by the same police scam as above, along a very quiet stretch of road between Kalimantan and Gunung Kawi. He wanted to see passport and driving licence (we had neither which was a good thing). He demanded 300,000, luckily I had a decoy wallet with only 50,000 in it so I got that out, we argued for a while and then he just sped off. Think the policeman was quite new to scamming, seemed nervous! If I had a licence he would have taken it and kept it until we found more money I imagine, so my tip is to keep a little money in a decoy wallet. I also think I I had just driven off he wouldn’t have followed.